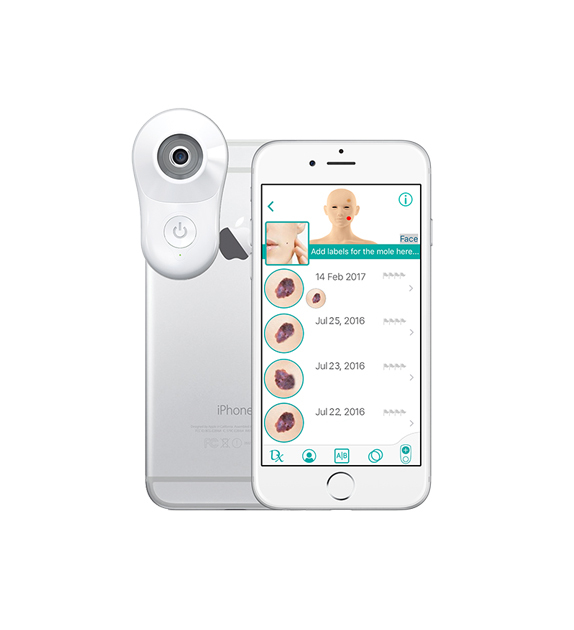 MoleScope™ is a smartphone attachment for dermoscopy that provides a high-resolution, detailed view of the skin through magnification and specialized lighting. Please note that MoleScope is not a diagnostic or a therapeutic device. It is intended for imaging, archiving and communication only. Online consultation is not yet available in all regions. Contact us for more information on service availability in your region. MoleScope Android attachments are available for selected models. If your phone model is not listed, please complete the request form for your Android phone. + Where can I buy MoleScope? + Do I need a smartphone? MoleScope is currently available to order for iPhone 5 / 5C / 5S / 6 / 6+ / 6S / 6S+ / SE / 7 / 7+ , iPod Touch 5 / 6 , iPad Mini 1 / 2 / 3 / 4 , iPad Air 1 / 2 , and iPad Pro 9.7" / 12.9". MoleScope is also available for many Android smartphones and Tablets. If your phone model is not available in the dropdown list, please fill out the request form and we will contact you when the device is available. + Is MoleScope available for Android? MoleScope is currently available to order for many Android smartphones. For a list of compatible Android devices, please see the dropdown list on our product page. If your phone model is not available in the dropdown list, please fill out the request form and we will contact you when the device is available. + Is MoleScope available on my tablet? MoleScope is currently available to order for iPad Air 2. For a list of compatible devices, please see the dropdown list on our product page. If your tablet model is not available in the dropdown list, please fill out the request form and we will contact you when the device is available. + Will the MoleScope app tell me if my mole is cancerous? No, the MoleScope™ app is designed to help you scan your moles for warning signs and to help your doctor make a more accurate diagnosis. The actual diagnosis is left up to your dermatologist. + How can the doctor tell if my mole is cancerous with just an image? All skin cancer screenings are initially based off of a visual examination; only suspicious moles will be removed or biopsied for further analysis. With MoleScope™, you are able to supply your doctor with high-quality images, with the same level of detail that they would be able to obtain in the clinic. By sending in your MoleScope™ image, you provide your doctor with the first step of the evaluation. Based on the image that you provide, your dermatologist may determine that your mole does not need any immediate attention or biopsy, and you can rest assured until your next regular checkup. For more suspicious moles, your doctor can ask to make an in-person appointment and perform a biopsy, if necessary. This way, the MoleScope™ system gives priority to people who need immediate attention, and gives peace of mind to those who do not. + How does the MoleScope lens compare to the images I could take with my smartphone? MoleScope™ provides high-quality images that are comparable to the images your doctor can take with a professional dermatoscope. + What if I need a second opinion? Once the service is available, our global network of skin specialists will be available for a second opinion. Yes. Your personal information is not shared with any third parties and is transmitted through our secure cloud services using bank-grade security features. + What do I get with my order? When you order your MoleScope™ package now, you will receive the MoleScope™ device and MoleScope™ smartphone app which will allow you to track your moles over time and take high-quality images. Doctor consultation services will be added gradually by region. + Do I need a separate MoleScope device for each of my family members? No, once our consultation services are available, a family plan will be offered. Each family member will be able to create an individual account and share the same MoleScope™ device and app. Sharing is caring! + Does MoleScope work for other skin conditions? Yes. Although MoleScope is designed to help track and monitor mole images, the device and app can be used to image other skin conditions such as acne, eczema, and psoriasis. However, because the MoleScope device provides contact imaging, it is not intended for use on open sores or wounds. MoleScope works best on dark spots on the skin's surface and can be used to image age spots, skin tone, as well as other closed skin lesions. + Can I Use MoleScope With A Phone Case? At this time, MoleScope cannot be used with a phone case, as the attachments have been designed specifically for each phone/tablet model to ensure the highest level of imaging quality. + What does melanoma look like? Melanoma is the deadliest form of skin cancer. It can either arise de novo or from one of your pre-existing atypical moles. It is important to learn about the warning signs and symptoms, and perform regular skin checks. Take a look at our ABCDE criteria to learn more about how to spot melanoma. + How do I know if my mole is suspicious? It is important to get to know your skin and check your moles regularly for any changes that may occur over time. A thorough self-check of your skin, including your scalp, nail beds, and other hard-to-reach places should be performed monthly to ensure your skin is healthy. You can use a mirror to help you examine areas of your body not easily seen, like your back. Follow our guide for a step-by-step skin self-check. + When should I go see a doctor? If you notice anything of concern on your body, or your mole is displaying any of the warning signs as mentioned in our ABCDE guide, make an appointment to speak with your doctor. 70% of skin cancer cases are initially spotted by patients or their family members, and the reality is that you know your body best. If something seems suspicious, make an appointment to speak with your doctor - and don’t delay! Early detection and prevention is essential for skin cancer, because when detected early, the survival rate is as high as 98%. + What are the risk factors of skin cancer? Skin cancer can strike anywhere. The common risk factors are: family history of melanoma, older age, lighter skin types and increased number of moles. Those with greater than 50 moles, atypical moles, lighter skin and a higher susceptibility to burn are more at risk than people with darker skin who do not burn easily. However, this does not mean that darker-skinned people, or those with fewer moles cannot get skin cancer. It is important to know the risks and stay protected, regardless of your skin type and situation. Learn about atypical mole syndrome here. + Skin cancer runs in my family, should I be worried? If a member of your immediate family has battled skin cancer in the past, you are at a higher risk than the general population. This means that you should take more precautions to check your skin and protect it from the sun. While family history is not the only risk factor, it is still important to take note and make sure you are seeing your dermatologist regularly. To find out if you are at risk, try our 1-minute quiz. iPod Touch 5th & 6th Gen.